"Brown and off-white banding encircle the entire building…(There are) eleven zia symbols… painted in yellow, red, brown and off-white… The banding near the entry way intersects a large Albuquerque Fire Department emblem painted in blue, grey, yellow and red. The design of this emblem was derived from the identification patch of the AFD and a metal AFD badge… The entry area is painted with scenes taken from historic photographs in the Museum of Albuquerque’s photo archives. 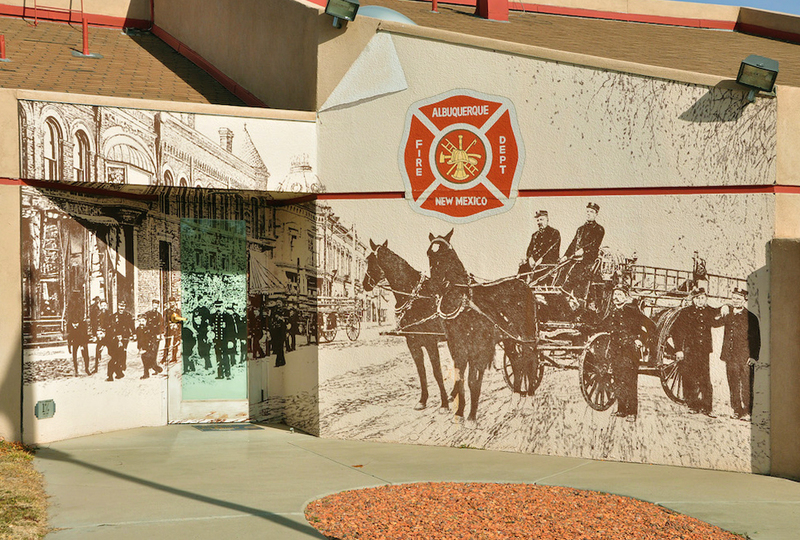 At least one photograph was taken by William Henry Cobb, a turn-of-the-century photographer and …a volunteer firefighter… The western wall depicts one of the last City of Albuquerque volunteer firefighter groups and the eastern wall depicts one of the first regular City of Albuquerque Fire Department squads…. Painted to resemble the sepia-toned photographs popular at the turn-of-the-century… One corner of the west wall is painted with a trompe l’oeil Dalmatian, the traditional fire station mascot." Celia Kimball is an artist and illusionist with commissions in both the public and private sectors, based out of Santa Fe, NM. She uses elements of symbols including signage to give a sense of depth, color and the scale of work for both pedestrians and residents driving by her works.